The composition of the elite technological club is altering. A decade ago, admission to IIT-Kanpur—only the brightest and the best could get past its gates—ensured a student demi-god status. Not any longer. Mumbai is the new Kanpur, with Delhi and Chennai snapping at its heels. The Kharagpur story is also making a comeback. 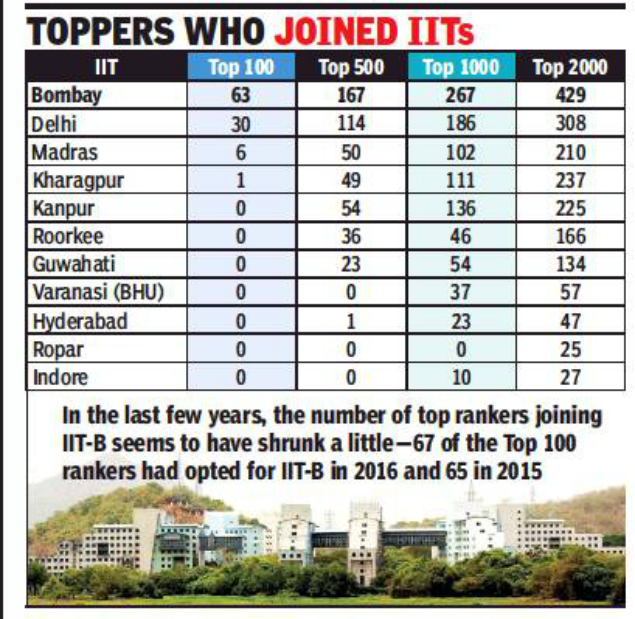 The newer IITs, which earlier did not get students below rank 1,000, saw IIT Hyderabad get a candidate below rank 500; IIT Indore too got students among the top 1,000 ranks. IITs in Goa, Dharwad, Tirupati, Jammu, Bhilai, Palakkad, Jodhpur and Mandi did not see a single student among the top 2,000 ranks sign up at any of these campuses. The choice of institute of the top 2,000 JEE rankers reveals that preferences have changed over time. A number of factors have been responsible for the reordering, from geography to gastronomy and placement records to what’s closer home. Twenty years ago, IIT-Kharagpur was the mecca of engineering education in the country. “While Bombay and Delhi were still building a reputation, Kharagpur’s students occupied top positions in big companies. Students looked at Kharagpur’s illustrious alumni and rushed there,” said a former JEE chairman But in over a decade, of the JEE top 100, almost none had chosen IIT-Kharagpur, the oldest IIT – there were 3 in 2005 and one in 2007. Till about two years ago, Roorkee was a step above Kharagpur. However, youngsters are now looking at Google’s Sundar Pichai and other illustrious Kharagpur alumni and signing up – 161 of the top 1000 rankers have picked Kharagpur. There was also a time when up to 30 of the JEE top 100 chose IIT-Madras, but that has changed with time. This year, there are only 6, and 50 in the top 500. Interestingly, of the top 500, six candidates did not sign up at any of the IITs, reflecting the fact that they opted for a course of their choice over an institute. “Candidates who might have been sure of opting for computer science or electrical engineering, but not getting into an older IIT, may have opted for an NIT or a IIIT,” said a dean. Among the top 1,000, 975 paid up to join the IIT system; 1,908 of the top 2,000 rankers did so. “We cannot tell if there may be more students who may drop out even after paying the fees. But these are the total candidates who have paid up to join the IITs,” said JEE (advanced) chairman Shalabh S.